The California Association of Highway Patrolmen has set up a memorial trust fund for the Casillas family as follows. One hundred percent of all donations received will go directly to the family. The CAHP Credit Union is covering all processing fees and administrative responsibilities. At approximately 9:00pm on Friday, March 9, 2018, officers with the Pomona Police Department responded to a call of a reckless driver in the 1400 block of South Palomares Street. Upon locating the suspect vehicle, a brief pursuit ensued when the driver failed to stop. The driver exited the vehicle after crashing, and ran into a nearby apartment complex. The suspect barricaded himself in a bedroom within an apartment and as officers attempted contact, began firing through the door. One officer was struck by gunfire, and upon attempting to assist his wounded partner, Officer Casillas was struck and fatally wounded. His partner underwent surgery Saturday morning and is expected to survive. SWAT officers and crisis negotiators responded to the scene. The suspect was taken into custody at approximately 2:00pm Saturday. 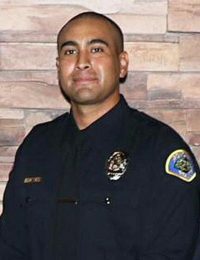 Officer Casillas, age 30, joined the Pomona Police Department as a records specialist before becoming a jailer in 2015. He later completed the San Bernardino County Sheriff’s Department academy and was sworn in as an officer in September of 2017. He was just completing his field training when he was killed. Officer Greggory Casillas is survived by his wife and two small children, and his parents. My heart is broken for this man who put his life on the line for us, so we can live in a safer place. my prayers are for the Pomona officers and his wife and children he left behind. I will sent money to his memorial fund. May the Lord Bless all the men in uniform.